ATC Semitec supply two forms of infrared sensor that measure high precision temperature measurement- by remotely detecting infrared heat from the target object – therefore providing measurement without any impact or physical effect. These are ideal for surface temperature measurement over other alternatives such as contact probes where the measurement of thin film plastics, paper or high temperature glass or metals is almost impossible using traditional methods. The NC sensor is a robust non-contact sensor primarily designed for use in office automation and other products with rotating motors whereas the thermopile is a very fast acting infrared sensor, often used in clinical thermometers. Utilising micro FT thermistor technology, Semitec have developed a sensor which can be easily installed, is self-compensating and can withstand more aggressive environments than conventional infra-red sensors. temperature measurement of drugs, chemicals and in high pressure environments. High resistance to dust – very little deterioration in output is caused by dirt or toner particles. 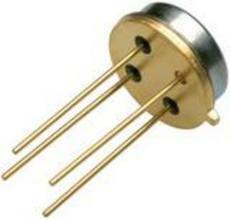 High heat resistance – operating temperature range is from -10°C to 150°C., measuring temperature from -20°C to 260°C. Resistant to electrical noise – no special housing required in micro-wave applications. Simple to use – using a thermistor sensor, the output signal output is very high and easy to process. Our Semitec 10TP series thermopile is a very fast-acting infrared sensing device suitable for non-contact applications such as clinical ear-drum thermometers. The Semitec 10TP583T thermopile is the result of silicon micro-machining technology where a series of miniature thermocouple junctions are combined to provide an output EMF based on the received infrared energy.